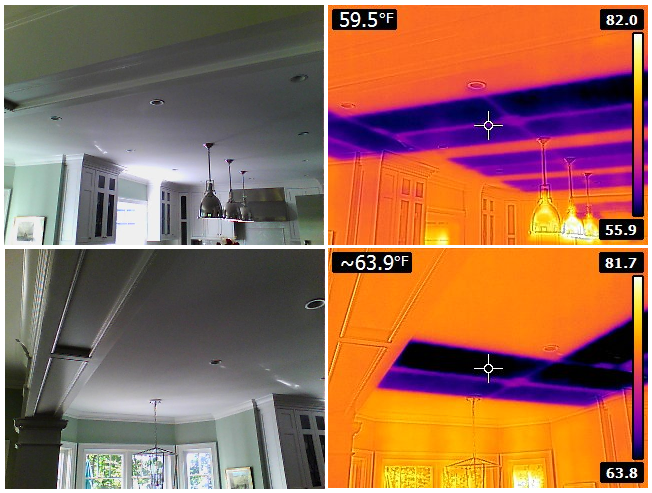 New house in New Canaan CT with radiant cooling panels on the ceiling. This home with radiant cooling in Connecticut was built by CMG Builder (Salvatore Zarrella). Surface temperatures in the kitchen are below 60F, with the dew point at about 55F. In the coldest part of the radiant panels, the surface temperature is just a few degrees above the dew-point temperature. 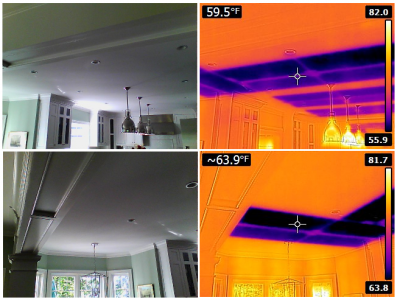 This avoids condensation and optimizes the performance of the radiant cooling panels (Ray Magic, gypsum panels installed in the ceiling). This house in Connecticut also features a neutral temperature dehumidifier system that allows for the extraction of latent heat and increases the performance of the radiant cooling system.